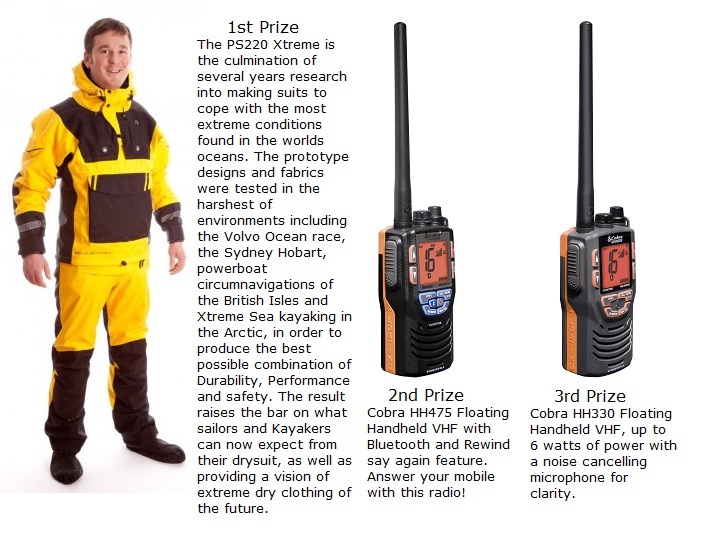 First prize is a brilliant new Typhoon PS220 Xtreme drysuit worth £600.00. 2nd Prize is a Cobra HH475 Bluetooth VHF worth £180. And 3rd prize is a Cobra HH330 floating handheld VHF worth £120. All you have to do is sign up for our newsletter using the box at the top left of our homepage. The winners will be drawn at random from all emails submitted before 31st July 2010 and each winner will be notified as soon as possible after this date. This entry was posted in General Interest and tagged Cobra, Handheld VHF, Typhoon on July 28, 2010 by Iain Forrest. is sailing in the Artemis Challenge at Cowes Week. Amy Williams commented: “Though I have never sailed before I am really looking forward to The Artemis Challenge at Cowes Week. I’ve always wanted to give sailing a try, and it’s great to be able to do something different; I’m sure life out at sea is pretty different to life on the skeleton bob track! I know everyone’s in it to win it, but it’s great to be racing not only for your yourselves, but also for others, since we’re all competing for charity. I just hope we have a quick boat!” Also onboard Artemis Ocean Racing is reigning Eventing World Champion Zara Phillips. Up against the pair will be Martin Bayfield - since retiring from rugby he has, amongst other things, played the role of Robbie Coltrane’s body double ‘Hagrid’ in the Harry Potter films. Martin will be joining British sailor Dee Caffari who holds the record for being the first woman to sail solo, nonstop, around the world in both directions. Their chosen charity is ‘Toe in the Water’. West Country sailor Steve White will be joined by James and Oliver Phelps, the Weasley twins from the Harry Potter films, who are also back for a second year in an effort to secure the £10,000 for the RNLI, their chosen charity this year and the Cowes Week official charity 2010. Back on the Olympic theme, checkout our TEAM GB gear and support our most successful sailing team ever! This entry was posted in General Interest, Race News and tagged Artemis Challenge, Cowes Week, Olympic on July 28, 2010 by Iain Forrest. and he's been stunningly successful with 4 gold, one silver and one bronze at Beijing. Therefore it's surprising to hear him complain that the National Sailing Academy in Weymouth is not exclusive enough. It is open to the public and foreign teams are using it as a training base. Next month's Skandia Sail for Gold regatta at Weymouth is one of the few Olympic-class events remaining before the next Games and takes place at the London 2012 venue. Most of the countries competing next month are using it as a pre-Olympic trial. How un-British to demand they get lost while team GB get on with their training. This entry was posted in Race News and tagged Olympic, Weymouth on July 27, 2010 by Iain Forrest. Darwin is at it again - Don't swap portable gas canisters next to a candle! Boat owners are again being advised to avoid using portable gas appliances with integral gas canisters on board boats following an explosion on the Norfolk Broads that sent two people to hospital with burns to legs, hands and faces. The explosion happened when the gas canister of a camping stove was being changed in the open cockpit of a small sailing boat where candles and cigarettes were in use. The Boat Safety Scheme (BSS) is urging boat owners to treat all such portable gas equipment with great respect and change fuel canisters away from the boat and sources of ignition. BSS manager, Graham Watts added, “This incident is a lesson to everyone that even portable gas equipment can cause an explosion big enough to send people to hospital. In the poorly ventilated, tight confines of a boat escaping gas is more dangerous than when it happens ashore out in the open. Be completely familiar with the correct and safe way of operating the appliance, from taking out of its storage case to fitting new fuel canisters. He added “think about the alternatives, for example, if all you want is a hot drink onboard a day boat, a flask is probably the simplest and safest way. If wanting light, some battery powered or wind-up LED lights will last for ages and are far easier to use than gas lanterns. Where a simple cooker is needed aboard, think about installing a marine spirit stove as an alternative to a portable gas stove.” Inland waterway regulations do not ban portable gas equipment on boats, but when not in operation, any appliance with a canister fitted and all spare gas canisters, empty or full, must be stowed in lockers that are self-draining, or on open deck areas where any leaking gas will flow overboard. The risk of causing a pool of explosive vapour inside the boat must be avoided. This entry was posted in Safety and tagged BSS, Gas on July 26, 2010 by Iain Forrest. This entry was posted in Race News and tagged Garda, SB3, World Championships on July 26, 2010 by Iain Forrest. on a TP52 skippered by Dean Barker in the Sardinian leg of the Audi Medcup? This amazing prize includes return flights to the race and one nights accommodation. For a chance to win simply email [email protected] with your name and what type of sailing you do: Dinghy Sailing Inshore & Coastal Sailing Keel & Sports Boat Racing Offshore & Ocean Sailing We will place your entry in the competition. This promotion is open to all UK residents, except for employees and their immediate families of Douglas Gill International Ltd., their agents, or anyone else professionally connected to the promotion. The free prize draw will take place on August 10th 2010 and the winner will be notified by email. The winner of the Free Prize Draw may be requested to participate in reasonable publicity. There is no cash alternative to the prize and the promoter reserves the right to offer prizes of equal or greater value. Illegible, damaged or defaced entries will be disqualified. The name of the Free Prize Draw winner will be available upon request by sending a SAE to: Gill, Manor House Road, Long Eaton, Nottingham, NG10 1LR. The promoter reserves the right to vary or terminate this promotion at any time due to wholly exceptional circumstances beyond their control that make it impossible to continue. This entry was posted in General Interest and tagged Audi Medcup, Emirates Team New Zealand, TP52 on July 22, 2010 by Iain Forrest. Marine Binoculars Save £17, now only £29.99 Waeco Coolbox 26L 12V Save £16, now only £39.99 Garmin Nuvi 1490TV Widescreen 5.0" display - Satnav and Television! £55 off, now £244.99 Isotherm Cruise 49L Cabinet Fridge Save an incredible £136, now reduced to only £469.99 And don't forget to have a look at our bestsellers for some other fantastic offers: Typhoon Edge Lifejacket Auto+Harness. Incredible deal at only £44.99 Coastal Danbuoy now only £59.99 Neptune Cooker save £160! Jabsco Compact Manual toilet save £57! This entry was posted in Special Offers on July 21, 2010 by Iain Forrest. Heading South instead of to the Lake District this weekend? This entry was posted in Race News and tagged RSYC, Solent, Women’s Open Keelboat Championship on July 20, 2010 by Iain Forrest. More good stuff for you - You can go sailing on Windermere this weekend. This entry was posted in General Interest and tagged Lake District, Windermere on July 20, 2010 by Iain Forrest. This entry was posted in General Interest and tagged Steve White, Vendee Globe, Volvo Open 70 on July 20, 2010 by Iain Forrest.